This photo nicely sums up the reason for my Mad May’s radio silence (make that “blog silence,” I suppose.) Somewhere during the month of May, I slipped from controlling swarms to swarms controlling me. Despite aggressive splitting aimed at preventing swarming, some of my colonies swarmed with gusto. 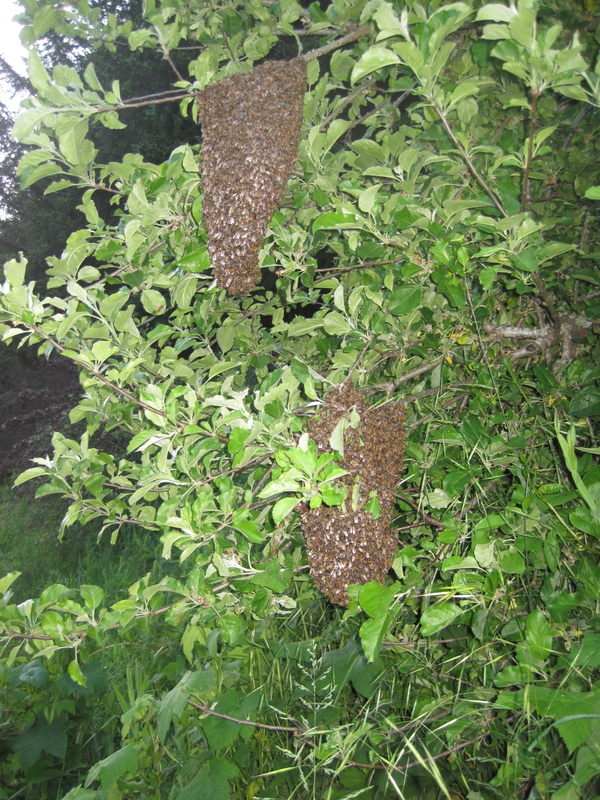 This double swarm, both parts of which were queenright, was successfully hived in twilit gloom after a hurried and premature departure from the Lane County Beekeepers meeting. Another swarm had taken flight earlier in the month just as I was in the middle of a routine inspection on Mother’s Day. While the colony had been previously divided, rainy weather and a hectic work schedule had prevented me from doing a good follow-up visit on it, and the queenright section of the split quickly out-grew the space I had given it. Upon further inspection, I found the hive replete with queen cells, and I was a little concerned that it would continue to swarm until it had dwindled to nothingness. What to do? I decided to allow the colony to split even further, but in a controlled way. While I lost the opportunity to make a lot of honey when the colony swarmed, I didn’t need to lose the genetics of a really gentle, productive bunch of bees. This is my homemade “queen condo” with a box of frames from the swarmed colony in front of it. I took advantage of the large number of beautiful, healthy queen cells and many frames of capped brood left by the swarm to create nucleus colonies. 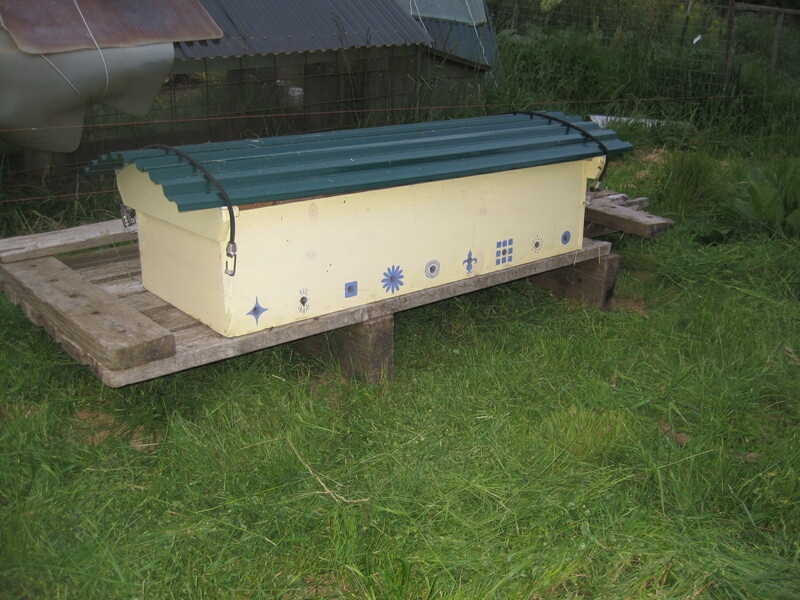 Four compartments of the condo each received three frames of brood, several swarm cells, and honey and pollen stores. The assembled queen condo can house nine mini-colonies. I was concerned about the freshly-mated queens returning to the correct section, so I spread the new colonies throughout the condo with empty compartments between in hopes of getting them home to the right place. At this time, three of the four nucleus colonies have mated, laying queens in them. 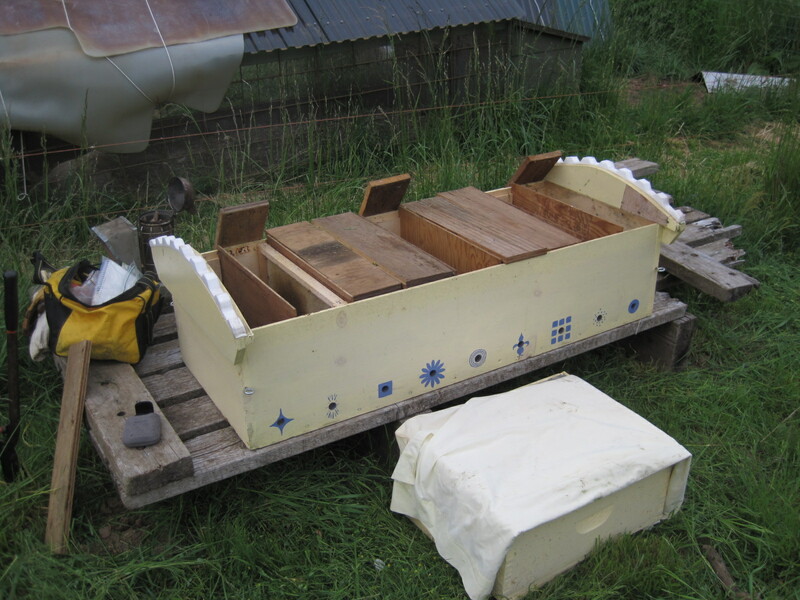 Hurrah for damage control, and may June bring more honey and fewer swarms! Wow Kelly! I would be proud to catch those swarms! Nice location, Big and Fat swarms, What could be better? Thank-you, Max. The follow-up stories on those swarms are fodder for another day’s blog…they have really kept me guessing and very humble!